My friends and I decided that we were going out for a guy’s only outing. But the girls wanted to be included...let's just say that we cave in... Cause being in the "dog" house and being put in an arctic hold (if you know what I mean) is altogether a bad idea. You would have reacted the same way, by inviting the girls as well. As our personal way to get revenge, we were going to make it an all the things guys love, college football and baseball! We decided this time around to go to Detroit Michigan. Land of the Tigers and Wolverines, and that is exactly what we had planned. One of my friends told me about this awesome website where we can get discounts on renting a car, which we will need. It is called rentalcarmomma, sounded stranger at first when I heard it, but trust me I found a great discount! Since it was a bunch, we rented a minivan. I was a little apprehensive cause i thought it was going to be a lot, but hey it didn’t come out that much. The discount, you may ask... $227.45, for the six of us, that is about $38 each...for three days, it is a bargain! 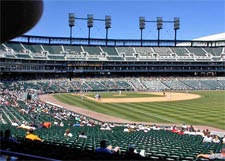 We bought tickets to go to Comerica Park, which is home to the Detroit Tigers. we are gonna see them play the Chicago White Sox. Another good thing about the ballpark is that it has a museum portion that shows statues of the baseball greats who played with the tigers, like Ty Cobb and Sparky Anderson and many more. Plus includes memorabilia from those early years and modern day baseball, which is awesome!